This series of graphs is from Gunderson et al. (2012) and originally published in the journal, Global Change Biology. In this experiment the researchers were asking the question, what is the effect of elevated temperature on phenology and the length of growing season. Phenology refers to the timing of certain events especially with respect to an organisms’ life cycle. The phenological metrics used in this study included, bud burst, senescence and abscission of leaves in four common tree species. Changes in these metrics will affect the length of growing season by increasing/decreasing the number of days leaves can potentially photosynthesize. In this experiment, the scientists used four different species to answer their question: Liquidambar styraciflua (American sweetgum), Quercus rubra (northern red oak), Populus grandidentata (bigtooth aspen), and Betula alleghaniensis (yellow birch). The first bar graph (with colored bars) shows how the timing of bud burst in the spring changes with temperature. On the y-axis in bud burst recorded as day of year (i.e. a smaller number is early in the spring). The x-axis is species and the colored bars represent temperature treatments (A= ambient, E2=2+°C, E4=4+°C above ambient). This results support the idea that temperature is one of primary abiotic signals for leaf phenology in both the spring and fall. 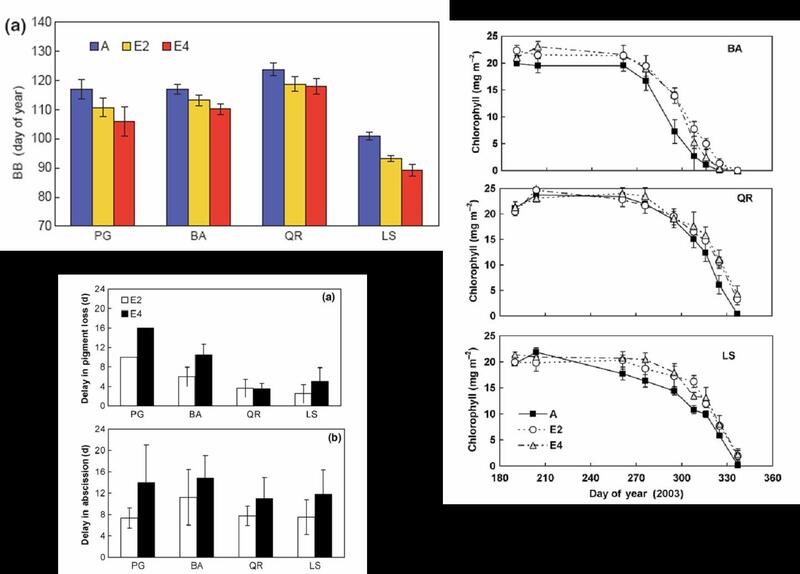 The second set of graphs (line graphs) show how chlorophyll concentration changed with temperature treatment for three of the species (There is no Populus graph because of mite damage to many of the experimental trees). All three species show similar trends in that chlorophyll content is higher in trees grown under higher temperature throughout the main part of the growing season. The third set of graphs (black and white bar graphs) show how leaves later in the growing season are affected by elevated temperatures. The top graph has delay in pigment loss on the y-axis. As trees prepare to drop their leaves due to decreasing light levels and temperature plants begin to shut down pigment production. With higher temperature one may hypothesize that pigment loss or diminution would be delayed. This is the pattern that emerged for most species although some of the differences may not be significantly different. This graph also demonstrates that not all species will respond similarly to changes in the environment and species’ responses to vary in both direction and magnitude. The final graph shows delay in leaf abscission four species. Although there is a lot of overlap with respect to variation an overall trend in delayed abscission is clear between the treatments. What is important also is to consider the total impact of earlier bud burst with delayed abscission. The author calculated this total difference in growing seasons with increasing temperature to average 5–18 days longer under E2 conditions and 6–28 days longer under E4 conditions. Again this varies with species and with Quercus showing the smallest response. 1.Once students consider that both the total number of leaf-days is increased and chlorophyll concentration increases with temperature a connection to the amount of photosynthesis occurring should be realized. Ask students what does this mean for biomass production and possible carbon dioxide uptake from the atmosphere. 2.There could be other ecological consequences of this longer growing season. For example, more leaf biomass may introduce more total carbon to soil microorganisms when leaves fall to forest floors. This may stimulate soil respiration and potentially increase CO2 emissions from soils. 4.These data presented here show some of the effects of higher temperatures specifically on growing season. Have students brainstorm other effects of increased temperature and hypothesize how plants may respond. (For example: how will increased temperatures affect rates of evapotranspiration and water stress with plants? Hint: have students review what happens with gas exchange when stomata open). How may the different types of plants (i.e. C3, C4, and CAM) vary in their responses to changes in carbon dioxide, temperature, and drought condition under climate change?